This article is also published on The Jesuit Post. We can probably all agree: Super Bowl LIII was a total snooze. If your eyes drifted from the television seeking entertainment elsewhere (who could blame you? ), you might have stumbled upon the most entertaining hashtag of the night: #SuperBowlintheConvent. Sure, Twitter might be best known for our President’s frequent bursts of activity or perhaps as the fertile breeding ground of internet trolls. But that’s not all that’s out there! The Pope, for example, has had an account since 2012 (Benedict XVI was the first Pope to tweet) and religious men and women (plus America Magazine and The Jesuit Post) are actively engaged on the platform. If you are looking for big names in the Catholic Twitter world, look no further than Sister Theresa Aletheia, F.S.P. She is one of the most active and popular religious women on Twitter, with over 25K followers. 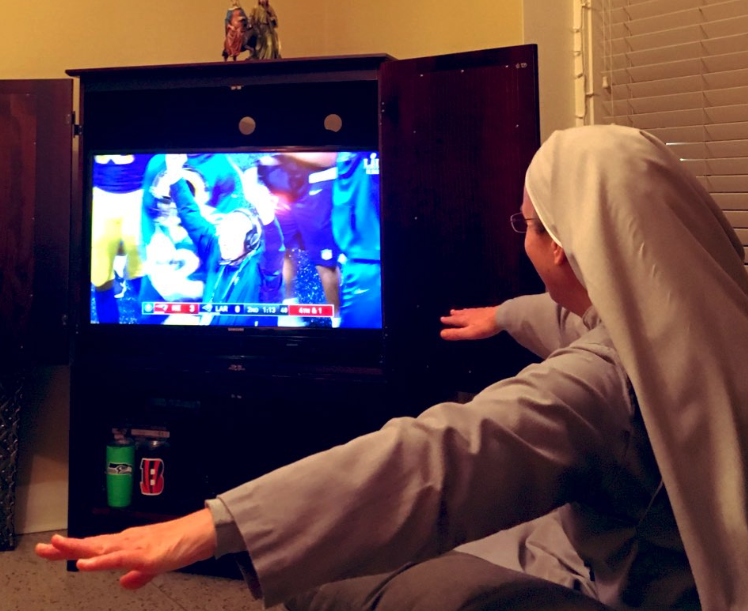 Two years ago, she started the hashtag #SuperBowlintheConvent which she used for tweets about the things said or observed among nuns watching the game together. It was such a success that she solicited participation from a handful other nuns and the results the past couple of years have been spectacular. Announcer: It’s been one of the lowest scoring first halves in history. *Adam takes shirt off, Housemates in unison: NOOOOO!! Nun 1: WOOHOO! Maroon 5 is next! Nun 2: huh. I thought Maroon 5 was a gum. As these Tweets began circulating, people across Twitter were remarking on how fun and fascinating it was to get these perspectives. Popular fascination with nuns and religious sisters continues in our country today. While we are nearly 30 years removed from Sister Act, plenty of movies and television shows about the lives of nuns continue to get attention. Call the Midwife is a BBC series in its eighth season telling the story of a community of nuns who are nurses. The Sisterhood: Becoming Nuns was a reality show in 2014 that followed young women discerning religious vocations. And then there is the horror genre, with films like The Conjuring 2 or last year’s The Nun that exploit our mixed fascination and fear of nuns. Why are people fascinated by nuns doing normal things? All this interest continues despite the precipitous decline of nuns in the United States, with the population falling by 72.5 percent from 1965 to 2014. While the population of priests has also fallen substantially during that period, its decline of 35 percent is notably slower. The reality is that there are far fewer nuns in our country today and far less interaction between the average Catholic and a religious sister. Catholics no longer grow up with religious sisters staffing their local grade school. Images like the nun wielding a ruler and striking at the hands of the Blues Brothers now harken to an earlier time. Thus for many Catholics, popular culture is the only place where they encounter sisters today. Of course, the numbers of a decreasing population of nuns do not tell the whole story, as evidenced by the hundreds of women entering convents and religious life every year. This younger generation might not be filling the staff of local parochial schools, but they are finding ways to engage the world in ministry, sometimes in creative ways. This includes Twitter. And given the global reach and the thousands of followers nuns like Sister Theresa Aletheia have, it is one way to extend their reach to people who might not otherwise interact regularly with nuns. 3. We all need some joy! And it's easy to spread when you want to. #superbowlintheconvent is making me think about converting to Catholicism. 30% drop in priestly vocations, but 70% drop in religious sisters vocations. It would be interesting to see what the drop in religious brothers vocations is for comparison. Brian Strassburger, S.J., is a Jesuit scholastic studying theology at the Boston College School of Theology and Ministry. He is an editor at The Jesuit Post.